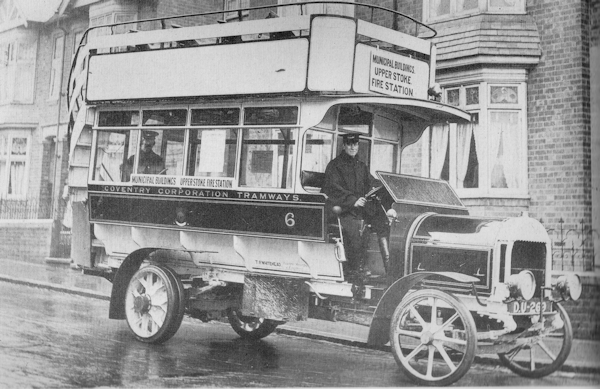 These were Coventry's first buses. They were delivered in March 1914, but requisitioned by the War Department in September of the same year. There is a photograph or DU263 on Ball Hill, but the fleet number is not visible. DU264 is definitely identified as Number 2 and DU269 is definitely identified as Number 6. Peter Gould groups the buses as 1 to 4 and 5 to 6, so it is reasonable to suggest the registration numbers shown below. 1 1914 1914 DU263 There are detail differences between DU263 and those shown in other surviving photographs. The body appears to sit higher on the chassis, mounted on supporting cross-members, whereas the others appear to be mounted directly onto the chassis.